Although dying of throat cancer Grant refused to stop writing the memoirs that would restore his families lost fortune. 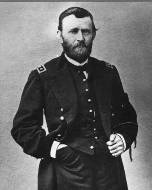 He died just weeks after completion leaving behind one of the greatest first hand accounts of the American Civil War. Grant was the 18th President of the United States.
" Although a soldier by profession, I have never felt any sort of fondness for war, and I have never advocated it, except as a means of peace. "